Ever since I was a little kid, I've always had nightmares around full moons. Not just on the actual day, but also the day after, the day before. And it's always variations on the same nightmare - me being chased, me being horribly late for something. As you can imagine, it's not pleasant - not for me, not for those around me (after three semi-slepless days in a row, I usually turn into that most feared of adult beasts: the cranky old man). But at least it seems like that's the extent of my sleep problems - when the planets are not aligning against me, I'm usually a very sound sleeper. Yesterday was a full moon, so it shouldn't come as any surprise that I slept horribly. 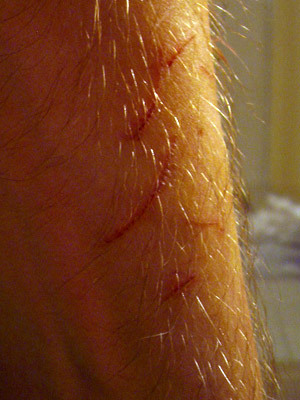 But what is surprising, though, is that when I woke up this morning, I discovered a set of fresh scratches on my left arm. And I have absolutely no clue how they got there.